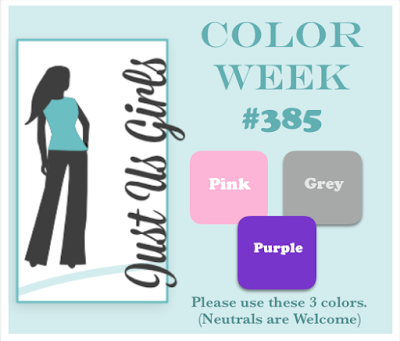 It's Color Week at Just Us Girls and Lisa has chosen pink, purple and gray. What's better than pink and purple flowers? Why don't you head on over to Just Us Girls to see what the Design Team did with these colors. If you make a card you could be chosen Chic of the Week and have a chance to be a guest designer like Nance Salkeld. Love how you have coloured those flowers differently on the top and bottom. So very pretty Bobby! LOVE what you have done with these stamps. Great take on the color challenge, that grey is perfect here. Beautiful!! This is a lovely card!! This is gorgeous! The arrangement of your flowers is perfect with the sentiment. You and I were on the same wavelength once again! Okay , Now I think I have to have these painted flower stamps! This is so lovely Bobby! Oooh! So pretty! Love these flowers! Gorgeous card Bobby! Love those pink and purple flowers! Beautiful! Pink and purple are my fave! Just gorgeous.